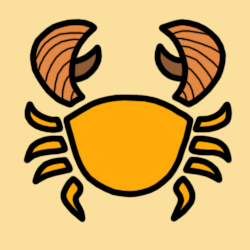 Cancer Horoscope for November 2019. Cancer horoscope for the month of November 2019 reveals fun, creativity, romance, career, tactful, collegues, humour, spontaneity, domestic activities, emotional issues. For Cancer, November 2019 is also a month of recognizing your pleasures and happiness demands, reinventing your diet and health regimes. The influences arrive early for Cancer natives born early, in the 1st Decan (Jun 23 - Jul 1). Those who are born later, in the 2nd Decan (Jul 2 - Jul 12) and 3rd Decan (Jul 13 - Jul 22), would experience the influences delayed and somewhat differently, as presented in the horoscopes below. Our monthly forecasts are divided into 3 distinct Cancer decans. To know more about the Decans of Cancer, click here. If you find this confusing, please read only the 1st Decan for all Cancer monthly horoscope forecasts. The Sun this month continues to emphasize the playful, creative, romantic, and emotional side of your self-expression - until 22nd November, after which the Sun seeks to attend your regular tasks, and bless your efficiency in work and health routines - for the rest of the month. Venus this month continues to attract you to aesthetic forms of recreation, making you charm your way to popularity - until 1st November, after which Venus seeks to bring more tact and diplomacy to your relations with the people you work with, making your talents or skills especially appreciated - until 26th November, after which Venus seeks to incline you to flatter and charm others, paving for meaningful and harmonious relationships on both social and romantic levels - for the rest of the month. Mercury this month continues to make you proud of your ideas, and very good at expressing them to others smoothly now - throughout the month. However, take time to reflect and review while Mercury is retrograde this month from 31st October to 20th November. Mars this month continues to animate you with more instinctive energy for domestic activities, making you defensive and protective - until 19th November, after which Mars seeks to enthuse you with self-expressive energy, making you playful, magnetic, and likeably competitive - for the rest of the month. Full Moon on 12th November seeks to bring you pleasure - your hobbies, romantic activities, and so forth, or even a humanitarian gesture; while the New Moon on 26th November seeks to set new diet regimes, healthy routines, and satisfying work schedules. Also, Mercury is retrograde from 31st October to 20th November, when you might tend to be judgmental in matters of romance, children, and creativity - perhaps blowing issues out of proportion. The Sun this month continues to spotlight your feeling of belonging, family, home, property concerns, roots, and heritage - until 2nd November, after which the Sun seeks to emphasize the playful, creative, romantic, and emotional side of your self-expression - for the rest of the month. Venus this month continues to attract you to aesthetic forms of recreation, making you charm your way to popularity - until 9th November, after which Venus seeks to bring more tact and diplomacy to your relations with the people you work with, making your talents or skills especially appreciated - for the rest of the month. Full Moon on 12th November seeks to bring you pleasure - your hobbies, romantic activities, and so forth, or even a humanitarian gesture; while the New Moon on 26th November seeks to spark your creativity and self-expression, and highlights romantic inclinations. Also, Mercury is retrograde from 31st October to 20th November, when you might tend to be judgmental in matters of romance, children, and creativity - perhaps blowing issues out of proportion. The Sun this month continues to spotlight your feeling of belonging, family, home, property concerns, roots, and heritage - until 12th November, after which the Sun seeks to emphasize the playful, creative, romantic, and emotional side of your self-expression - for the rest of the month. Venus this month continues to attract you to aesthetic forms of recreation, making you charm your way to popularity - until 17th November, after which Venus seeks to bring more tact and diplomacy to your relations with the people you work with, making your talents or skills especially appreciated - for the rest of the month. Mercury this month continues to make you proud of your ideas, and very good at expressing them to others smoothly now - until 10th November, after which Mercury seeks to make your memory more retentive than usual, and your thoughts often turn to personal matters, family, and loved ones - for the rest of the month. However, take time to reflect and review while Mercury is retrograde this month from 31st October to 20th November. Mars this month continues to stimulate you with many ideas and plans, making you communicate in a more direct, assertive, self-centered, or provocative manner - until 4th November, after which Mars seeks to animate you with more instinctive energy for domestic activities, making you defensive and protective - for the rest of the month. Full Moon on 12th November seeks to place you in the limelight, where everyone notices you - highlighting your competence and career matters; while the New Moon on 26th November seeks to spark your creativity and self-expression, and highlights romantic inclinations. Also, Mercury is retrograde from 31st October to 20th November, when you might tend to be judgemental towards family members - perhaps frustrated with activities surrounding home and property. Regarding monthly horoscope forecasts for November 2019, that is all for Cancer. You may also read our 2019 Cancer Yearly Horoscope Predictions to refer the overall scheme of astrological influences. All predictions are based on the assumption that you are born with Sun in Cancer. Since, the positions of the other planets in your Natal Chart are not considered, we expect the predictions above to be approximation, rather than accurate. Based on the other planets, there may be some minor variations, suppression or even elevation of certain trends. More accurate predictions may be interpreted only with personalized Natal Charts.